HSN Community / Forums / Crafts & Sewing / A New Cartoon for Crafting Fans! 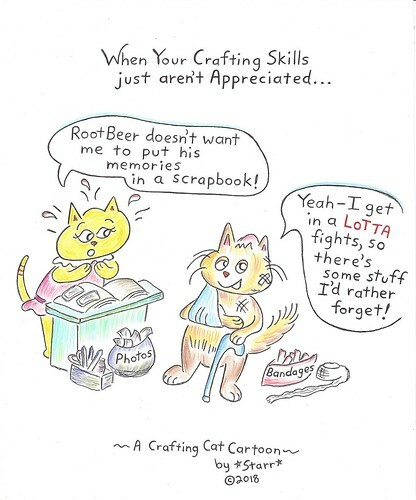 A New Cartoon for Crafting Fans! Hi Jollyjelly …. another Winner! Smartypants and Cherie just Love this one too. Smartypants always Loves “Yellow Kitty” …. We both think “Root Beer” is hilarious with his sack of bandages and his little cane. We appreciate Every cartoon Jollyjelly. We want to wish you a Happy New Year! Cherie, I hope you and Smartypants have the best year, ever! This reply was modified 1 year, 3 months ago by jollyjelly. That’s fantastic Jollyjelly! I was hoping to see a cartoon from you today. I would love to see some of your other cartoons. You are VERY talented! which is just fun and cute–doesn’t take sides on politics.